The organisational fan in me start getting excited when there's categories involved! I sort mine by type of clothing e.g skirts, trousers, dresses, then I organise those by colour. So I know if I have a top that would go great with a black skirt, I just flick to the back of my skirt category to find it. It saves so much time and gives my heart a squeeze when I see everything in order. 2. Pack away seasonal clothes. You see those two clear boxes towards the left of my wardrobe? Those are my winter clothes, things like thick jumpers, warm dresses and cosy tights all get folded in there. This helps to make room for my summer clothes, rather than cramming everything in as you won't be able to see anything properly! This is also a good time to pull out that cardigan with a missing button or a top with a big stain that you've been meaning to soak since you got it. I make a little pile of things to repair or deep clean then after I've done re-organising my wardrobe I set to work sorting them out. Anything that you're looking at and thinking it's a bit old now or too small/big etc. it could go to a much better home elsewhere! We have a few local charities that are always happy to take a few bags off our hands. If it's something that has a dirty mark on it or good do with a wash, put it in the washing bin beforehand. Also if it looks like it's had better days, you can find local places to recycle or sometimes your bin collection take clothes too! 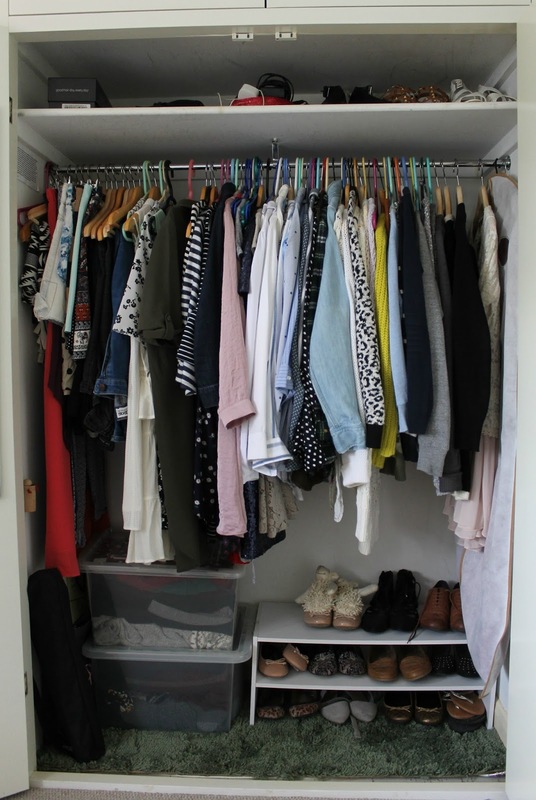 How do you re-organise your wardrobe? Any tips?